For example, let’s say you hire a company that does window cleaning in Tulsa. They do an excellent job cleaning your windows. Furthermore, they went the extra mile and also cleaned your screens. At the same time, they were both friendly and accommodating. Of course, you agreed on a price to have your windows cleaned. They perform the work well and now it’s time to pay. Should you feel obligated to tip your window cleaner? Here at gleaming glass, we know the situation can be awkward for you. Furthermore, if you would like an awkward free window cleaning experience give us a call at 918-850-9798. Tipping is money given to a service worker in addition to the agreed-upon amount. It’s a way for the customer to show that they are grateful for the service they received. If a guy is window cleaning in Tulsa, and he goes the extra mile, the customer might tip him. At the same time, the customer might not be in a financial position to do so. Even if the guy window cleaning in Tulsa goes the extra mile. By the same token, you might be financially fit. In that case, you should definitely tip your window cleaner. You should not feel obligated to do so though. Here at gleaming glass, we charged enough to make a living. We are not relying on your tip to pay for groceries this week. Where did tipping originate from? Tipping actually originated in England. It started out in Tudor England. At this point, in the 17th century, guests who spent the night at homes we’re expected to tip. As a matter of fact, these tips were given to the hosts servants. Presently, this would be like spending the night at a hotel and tipping the guy carrying your luggage. Of course, this took place in the 17th century and there were no hotels back then. Consequently, people spent the night at private residences. How much should I tip my window cleaner? By and large, modern-day tipping is common when you think about waiters and waitresses at restaurants. It’s not as common with window cleaning in Tulsa. At this point, leaving a 15% or 20% tip is common. For this reason, those percentages have transferred over to other industries as well. For this reason, if you are going to leave it it for your window cleaner, we would recommend a 15% or 20% tip. Of course, this all depends on how well your window cleaner did. Were they courteous? Additionally, how well did they clean your windows? By the same token, did they respect your home and your belongings? These are some things you need to consider when leaving a tip. For this reason, the technicians at gleaming glass go above and beyond to exceed your expectations. Window cleaning company policies on tipping. Something else to consider is the window cleaning companies policy on tipping. Some window cleaning in tulsa companies don’t allow their employees to collect tips. Other window cleaners are perfectly fine with their window cleaning technicians receiving tips. It just depends on the business owners viewpoint of tipping. As a matter of fact, some business owners see tipping as an incentive to make their employees provide quality service. Consequently, the window cleaning technician will want to go the extra mile. For this reason, they will work hard for that tip. Tipping your window cleaner can come in many forms. Tipping can come in many forms. Here at gleaming glass we have had customers tip us with cash, food, free stuff, and even discounted services. The most common form of tipping his obviously cash. However, the second most popular form of tipping in our company is food. We like both cash and food. At the end of a long day of window cleaning, old forms of tipping are appreciated. I have also had many customers offer me a cold water bottle to drink on a hot day. Here in Tulsa Oklahoma temperatures can soar into the 100’s and you can get dehydrated fast. It’s not really something that’s considered a tip around here. Moreover, it’s just good southern hospitality. 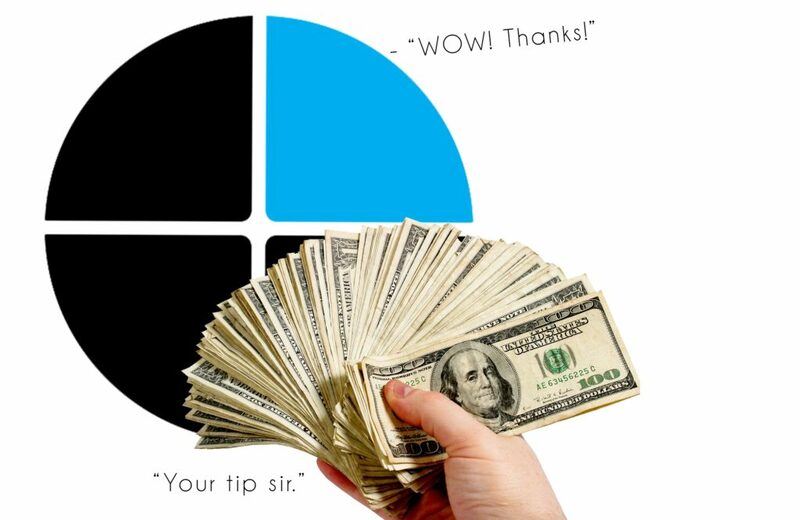 Let’s go over the pros and cons of the different forms of tipping. Cash tips for window cleaning in tulsa. Cash tips for window cleaning services is probably most popular because it’s easy. When you go to write out the check, it’s simple to tack on a little extra money. It takes no extra effort on the customer’s part. Therefore, the average window cleaning customer is most likely to tip with this method. Furthermore, tipping with literal cash as opposed to check is even better. Some customers understand how hard it is to be a business owner. They understand that the government makes it extremely difficult from a financial standpoint to run a business. Therefore, cash tips are always welcomed by most business owners. Food tips for window cleaning. The second most popular form of tipping for us is food. One instance that stands out in particular is when we were cleaning the Barney residence the week of Christmas. Mrs. Barney had just made some sugared baked pecans for her family and friends. We happened to be cleaning her windows that same day so she gave us a bag of pecans. I’ll never forget that day. From the window cleaners standpoint, they might even be more grateful for food then cash. I don’t know why but those warm pecans on that cold day were very memorable. They were incredibly tasty and chewy. I had to eat lunch that day, so they tasted that much better. Making a treat for your window cleaner might take a little more time, but it’s a more personal tip. Free stuff tips for window cleaning. So far, we haven’t had any customers give us free stuff. This form of typing really isn’t common. By the same token, it’s not expected to either. Ironically, if I were to be given some random free stuff as a tip, I would think it’s cool. Even so, don’t try to get rid of junk from your house by giving it as a tip. This is not cool. Hopefully this never happens to us! Even if it did though, it would make for a good memory. Hey remember that time so-n-so gave us all that junk? Good times! Discounted services for window cleaning. In my opinion, this is a pretty neat form of tipping. It’s not common among residential window cleaning customers. In fact, its more common among commercial window cleaning customers. Another example of when somebody tipped us is this. We had cleaned a new smoothie shop that was just opening up. They were so happy with the clean windows they gave us discounts off of their smoothies. Those were some delicious smoothies! Feeling obligated to tip your window cleaner. Tipping should be done with a cheerful heart. In the same way, you should be happy to give a tip when your window cleaner has gone the extra mile. It’s a way of showing that you’re grateful for their hard work. By the same token, it’s a great way to show them that you appreciate the value you received. You should never feel obligated to tip. Just because the window cleaner has a pulse and he cleaned your windows, doesn’t earn them a tip. I hate the feeling of feeling obligated to tip a waiter or waitress. It’s almost as though no matter how terrible the service is, you are expected to tip them. I don’t think this is right. Tipping should be merit-based. The better the service the better the tip.